Rhinoplasty, or "nose job", is a surgical procedure that changes the size, shape and contour of the nose. Known for delivering rhinoplasty, Dr. Simoni can help you obtain the nose you have always wanted. If you spend a lot of time thinking about the size of nose or wishing for a better profile, rhinoplasty, or a nose job, may be the cosmetic procedure for you. The nose is an important feature and plays a large role in determining our appearance. Some people would like to get rid of the bump on the bridge of their nose to improve their profile. Others would like a more refined tip and still others may have sustained some trauma to the nose or have difficulty breathing. Dr. Simoni's rhinoplasty can address all of these structural and aesthetic issues. Dr. Simoni meets with each of his patients for a consultation and will evaluate the nose based on the issues they would like addressed and the natural structure and aesthetics of their nose. He will then discuss your options based on the thickness of your skin, your age and the relationship of the structure of your nose to your overall face shape. Your decision should take into account all of these variations and what can be accomplished so that your nose complements your face and its other features. This will result in a balanced look that is reflected in both the frontal and profile view of your nose. The first step of your rhinoplasty surgery consultation is to tell Dr. Simoni what you would like to accomplish with the appearance of your nose. You can decide to reduce or increase the size of your nose, make changes to the bridge or the tip, narrow the size of your nostrils or change the angle of the nose between your upper lip and nose. He will then examine your nose and facial structure and make suggestions based on his experience and medical expertise. With the aid of 3D computer generated modeling software, he can also create projections as to what you can expect your nose to look like after surgery in comparison to what your nose currently looks like. This offers an added opportunity for additional dialogue between you and Dr. Simoni so that you are both on the same page regarding what you would like to achieve during your rhinoplasty. When the consultation is concluded, you will have a clearer concept of what you can expect with rhinoplasty so you can make the final decision as to whether or not this procedure is right for you. Dr. Simoni is committed to natural results for his patients and is happiest when friends and family tell his patients they look great but can’t tell they have had plastic surgery. 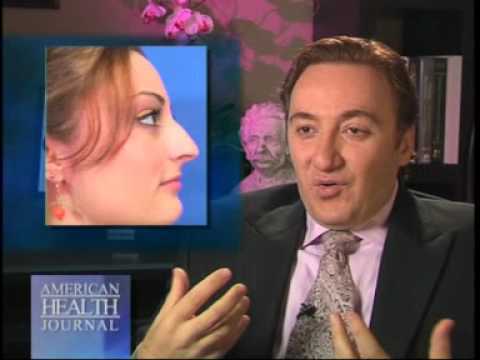 The open-tip or open-nose technique is the preferred rhinoplasty method by Dr. Payman Simoni’s. During the open-tip rhinoplasty, a minor incision is made across the vertical strip of tissue that separates the nostril cavities. This is called the columella. By doing an open-nose method, Dr. Simoni allows a more direct view of the nasal structure and can control the result with even more precision. Rhinoplasty is not usually recommended until the patient has finished their growth spurt, usually during the mid teen years, or 14 or 15 years of age for girls and 16 for boys. Our nose job procedure is performed in either a hospital or an outpatient surgical facility. It takes about two hours though more complex procedures can take longer. For example, rhinoplasty may performed in combination with other procedures designed to address the functionality of the nose by removing nasal obstructions. Generally, Dr. Simoni recommends his patients undergo general anesthesia for the majority of rhinoplasty procedures he performs. When the surgery is complete, a splint is applied to give structure to the nose and keep the nasal structures from moving. The splint also helps the nose maintain its new shape. Avoid hitting or rubbing your nose, or getting it sunburned for six months. You must remember that for the initial period after surgery your nose will be more sensitive to the sun and you will have to take special precautions, including the use of sunblock, hats, shades, etc. The discomfort after rhinoplasty is normally best managed by pain medication. The head will need to remain elevated. Cold compresses applied to the eyes reduces the normal bruising and swelling that occurs as a result of nose surgery. Some bleeding is normal during the first few days after surgery. It is also normal to feel congested for several weeks after your rhinoplasty. Dr. Simoni does not normally “pack” the nose after rhinoplasty. This allows patients to be more comfortable during recovery. Nasal packing is commonly used to control the minor bleeding that occurs after surgery. However, it can lead to additional unnecessary pain, swelling, bleeding and discoloration that can be minimized by avoiding packing the nose. At the end of one to two weeks, all stitches, dressings and splints will be removed. Most patients are able to move around their house in two days. Rhinoplasty patients normally return to school or sedentary work about a week after the surgery. It will take several weeks before your energy returns entirely and you feel back to normal. You will see results in two to three weeks, but full results will not be seen for 6 to 12 months as swelling will continue to reduce and the enhanced contour and form of your nose will become more evident. Within the nose, there are two primary structures which influence the flow of air through the nose. These are the septum, which is the tissue that divides the nostrils into two chambers, and the turbinates, several curved, shelf-like bones inside the nose. During your consultation, Dr. Simoni will examine the internal framework of your nose and can make suggestions for structural improvements based on your specific nasal issues if there are any. If you are experiencing trouble breathing, there may be a blockage in one or both nasal passages. Surgery to correct these issues can be performed in combination with cosmetic rhinoplasty or as an independent procedure. In a procedure to correct these structural issues alone, the external appearance of the nose is not affected. And because this type of surgery addresses a medical issue, it may be covered by your insurance. Dr. Simoni and his staff can discuss this with you in more detail and help in obtaining pre-certification from your insurance provider for the functional surgery. Keep in mind that insurance companies may require a 6-month wait period that may include extensive x-rays, testing and potentially the use of medication prior to approving the surgery. Is it possible to make cosmetic changes to just one part of my nose? Yes, it is possible to target just one aspect of the nose for improvement. It is very common for a patient to simply want to address the tip of their nose, which they may feel is too large or round. Another patient may want to leave the tip of their nose as it is and instead they want to get rid of a bump on the bridge of their nose. Dr. Simoni can consult with you on the various rhinoplasty options that are open to you and the potential outcomes of each so a surgery plan that will achieve your goals can be created. In some cases, especially for those patients who had plastic surgery more than a decade ago, a second rhinoplasty may be requested. This could be to correct an issue that came up after their first nasal surgery or because they did not get the results they wanted and feel that another surgery would create a better outcome. Revision rhinoplasties or secondary rhinoplasties are more difficult than primary rhinoplasties because of scar tissue that develops as a result of the first surgery. Additionally, too much cartilage may have been removed during the first rhinoplasty, which may require replacement and grafting from other areas of the body. Because of these complications, it is important to understand that the goal of these surgeries is improvement and not perfection. For these reasons, it is also essential that you carefully choose a surgeon experienced in successful revision rhinoplasties. The philosophy of the physician that performs your rhinoplasty is just as important as his skill, as the viewpoint of the surgeon will greatly affect your results. There are some cosmetic surgery procedures that are expected to produce dramatic results, as in the cases of liposuction or sometimes breast augmentation. However, cosmetic nasal surgery is not usually one of these procedures. Instead, subtlety is essential. Results of rhinoplasty should be balanced and attractive–not overdone or mismatched to other facial features. For males, the ideal nose is strong. This means straight, symmetrical and streamlined but not delicate, feminine or upturned. Ideal female noses are small and tilt slightly upward, in balance with the shape of the face. The success in achieving these results depends on mere millimeters of tissue. Thus artistic judgment and experience plays a major role in nasal surgery. Becoming familiar with Dr. Simoni’s work through before and after photos will orient you to some of the potentials that can be achieved with surgery. But regardless of your gender or image goals, you can be confident in the fact that Dr. Simoni brings this philosophy to every surgery in order to accomplish subtle results with each patient. Rhinoplasty fees vary significantly from surgeon to surgeon and across geographic zones. Similarly, talent, judgment, experience and skill also vary significantly among rhinoplasty plastic surgeons. It has happened that patients choose the surgeon with the lowest fees and end up with results they are completely unhappy with–forcing them to pay twice as much or more for corrective surgery, if they are even a candidate for correction. In the case of face surgery, it is very often not the best choice to get the cheapest surgery. Visit several doctors, review their credentials, study their before and after photos of actual patients and choose the doctor who you feel is the best fit for you and who makes you the most comfortable and confident in your decision. Honestly, this may not be the person with the highest fees. Keeping the primary criteria above in mind, fees should be the secondary concern. Once you find the doctor you want to work with, there are many financing options available to you. A positive rhinoplasty experience rather than a negative one can be priceless. The pain associated with rhinoplasty is classified as minimal to moderate. When necessary, this pain can be controlled with oral medication. Rhinoplasty complications are unusual but may include infection or nosebleed. You can reduce the likelihood of experiencing complications by following your doctor’s instructions carefully. Dr. Simoni strives to create realistic surgery plans that he and his patients agree with so all involved are on the same page regarding the desired changes. When people are unhappy with rhinoplasty results, it is often the result of a miscommunication between the doctor and the patient or overzealous surgical methods. Schedule your private consultation with Dr. Simoni today to discuss your options for rhinoplasty. Call our office at (310) 360-1360 today. There are two surgical techniques used in rhinoplasty; the closed technique and the open technique. In a closed rhinoplasty, the incisions are made inside the nose so there are no visible scars. 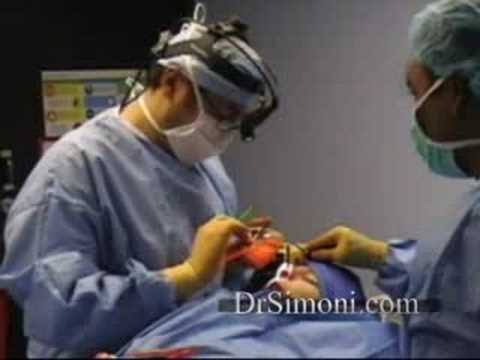 The open technique creates an incision in the cartilage dividing the nostrils allowing Dr. Simoni clear access to the internal structure. His reputation for providing among the best nose jobs is in part due to his ability to create incisions which heal to virtual invisibility. The technique that will accomplish the goals of the surgery depends on specific physical anatomy not on personal choice. How long before I can be seen in public? If the goal is to be able to attend a major social event such as a wedding, you should allow a month before the event. People heal at different rates. While some patients are quite presentable within two weeks of surgery, to be ‘high school reunion’ ready might take an additional two weeks. 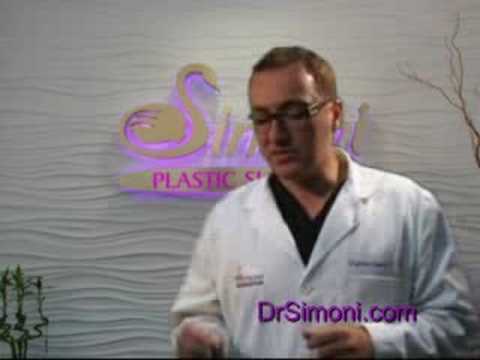 Dr. Simoni’s patients can almost always go out to run errands or meet friends within two weeks. As long as the activity level at work or school is the equivalent of a desk job, a week’s recovery should be enough time for any bruising or swelling to diminish enough to enable a return to work. For those with physically demanding jobs, Dr. Simoni will provide a timetable for recovery that matches work place or social activity level. Much depends on whether or not you want the procedure to remain confidential. In this case a return to work or school without raising the curiosity of fellow workers or students would need a solid two weeks of recovery. What about exercise and sports following rhinoplasty surgery? In order to achieve the aesthetic and functional goals of a world class nose job, the nose must be allowed to heal without any trauma or stress for the first year. The early weeks are most critical and during this time strenuous physical activity will need to be avoided to keep the blood pressure even. This doesn’t mean that all exercise should be avoided for a year. Dr. Simoni provides detailed recovery instructions outlining the return to normal activities along a tried and true timetable. Gentle exercise is desirable to keep the circulation healthy. Am I going to look really different? With Dr. Simoni’s keen sense of artistry combined with his exceptional surgical skill, you will look like yourself without the imbalances caused by your nose. The nose is the most prominent feature of the face. Getting his signature natural results is accomplished by bringing the nose into balance with the facial features to the end result that your nose will fit and compliment your face. Most patients mention how surprised they were with the ease of recovery. Although the early stages of rhinoplasty can look very dramatic to close friends or family, the pain is actually minimal. It is well managed with a few days of prescription pain medication followed by the use of approved over-the-counter remedies that do not contain ibuprofen. Ibuprofen is an anti inflammatory that thins the blood which can interfere with the healing process. The most common complaint is a very stuffy nose and pressure for the first few days. Who is the ideal rhinoplasty candidate? There is no specific criterion that defines the best candidates for rhinoplasty. Generally patients must be in good health and must have attained full growth and development in the face. Younger patients must be accessed to determine if their facial features are still growing, but a good rule of thumb is if the shoe size hasn’t changed in a year, they may be old enough for the procedure. Another category of rhinoplasty patient is someone who is unhappy with their previous result. Dr. Simoni sees many patients who fall into this group because of his reputation for providing among the most refined and natural nose job. As revision rhinoplasty is more difficult and requires the highest level of skill. His decades of experience and double board certification in facial procedures draws people to him from all over the world who want their earlier surgery repaired. If you are concerned whether or not you are a candidate for either primary or revision rhinoplasty, make an appointment to consult with Dr. Simoni. He will give you his honest opinion on your unique requirements by discussing your specific health issues and examining your nose to determine the best course of action. Will insurance cover the cost of my nose job? Most cosmetic procedures are not covered by insurance. In the case of rhinoplasty, if there is a functional problem with breathing, sleep related problems related to breathing, recurring sinus infections related to functional nasal problems, your insurance may cover that portion of the surgery. Our insurance specialist will be happy to review your coverage and advise you accordingly. Heidi Montag- Nose Job Again?